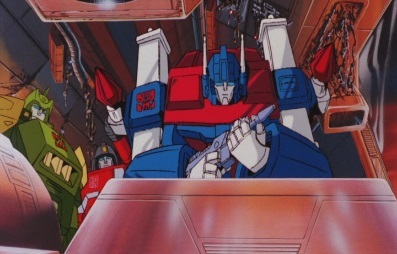 Hot Rod and Kup have just bought it, but Ultra Magnus says he can't deal with that now. 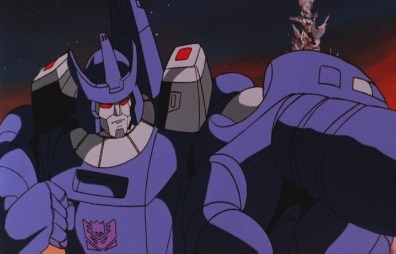 Galvatron is still after them in his own ship, and Springer says the Decepticons will just keep coming until they're dead. 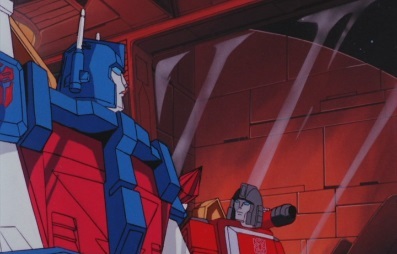 Ultra Magnus decides to deceive them, and says they have no other choice but to use the emergency separation, despite Perceptor's warning that it is too dangerous. 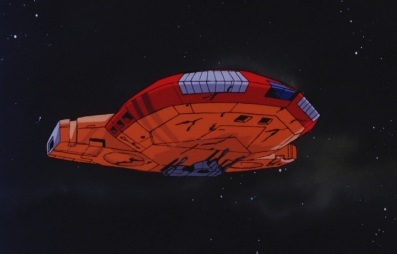 The front part of the shuttle separates and blasts away from the rest of the ship. 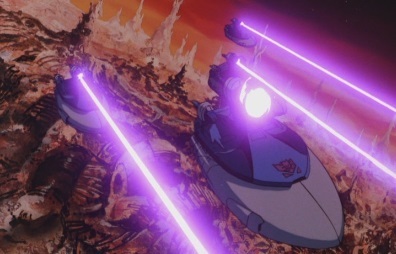 Galvatron fires several missiles from his ship, which hit their target and obliterate the Autobot shuttle. 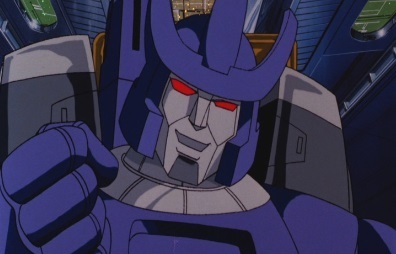 Cyclonus reports that the Autobots have been terminated, but Galvatron is more pleased that the Matrix has perished with them. 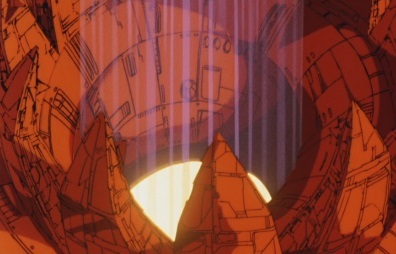 But suddenly, Unicron tortures Galvatron, leaving the Decepticon leader confused to why. 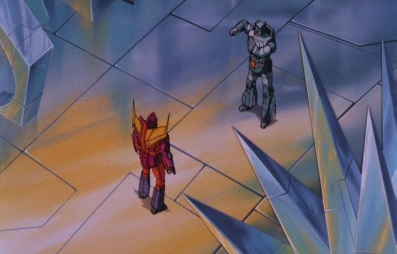 Galvatron tells Scourge to take him to Unicron. 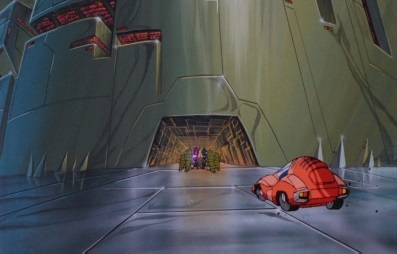 Meanwhile, the other Autobots have survived, but their small shuttle has been damaged and won't make it to Cybertron. 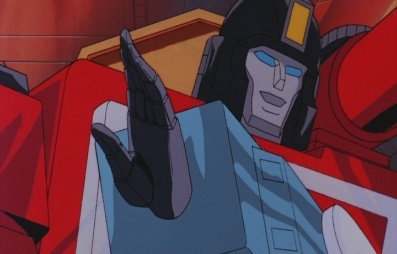 Perceptor finds out that the Planet of Junk is nearby, so Ultra Magnus says they'll head to it to do some repairs. 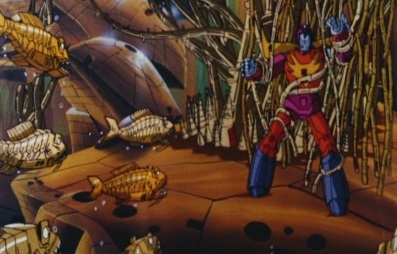 Meanwhile, Hot Rod finds himself underwater, where he is attacked by killer seaweed and giant robot fish. 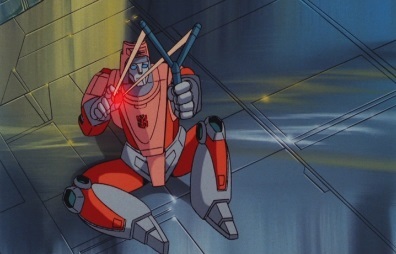 He transforms one of his hands into a buzzsaw and gets himself free, and then hears Kup calling out to him. 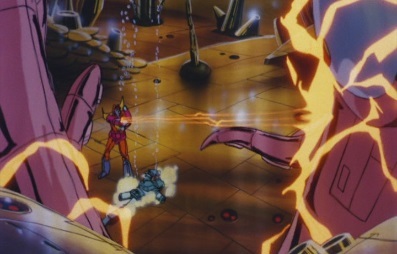 He finds that a giant robot squid has attacked Kup, so he starts to fight it. He eventually makes the squid retreat by blowing his left eye apart. 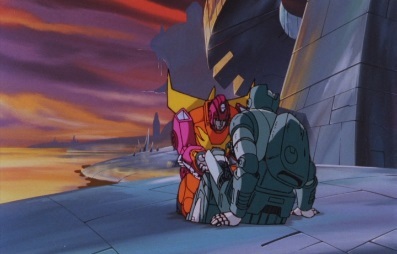 Hot Rod finds that Kup is still alive, but he's lost a couple of limbs. 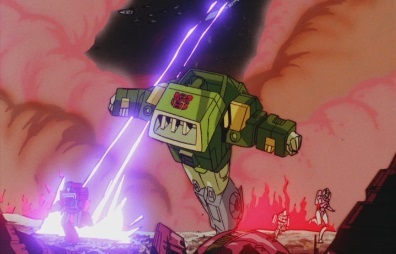 After collecting his broken body parts, Hot Rod takes Kup up to the surface of the planet. 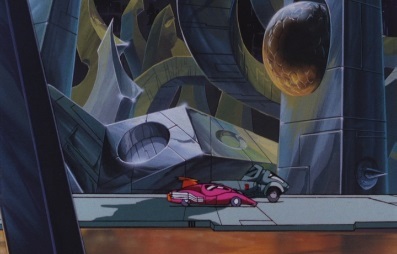 Meanwhile, the other Autobots arrive at the Planet of Junk. 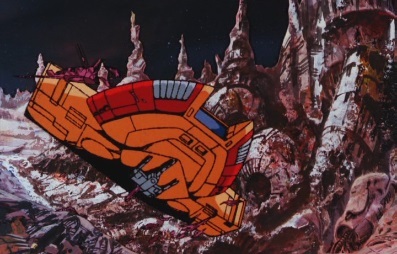 Apparently the ship's engines are damaged, as the Autobots have to make a crash landing. 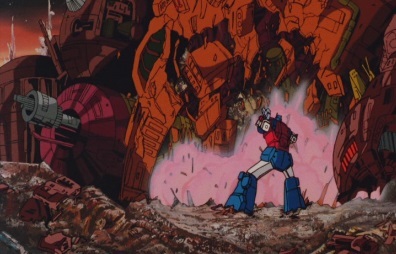 They all survive, and Ultra Magnus tells everyone that they'll have to try and salvage this thing. 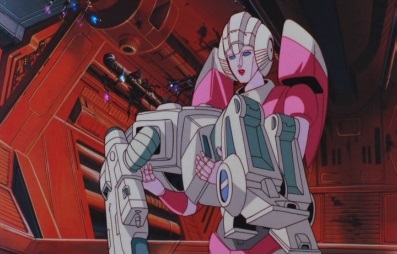 Daniel wants to help, so Arcee brings out one of Spike's exo-suits. 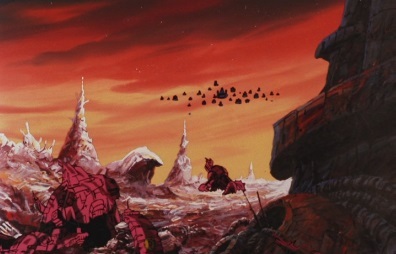 As he gets to grips with it, they all head outside and see that the Planet of Junk is a very desolate place. 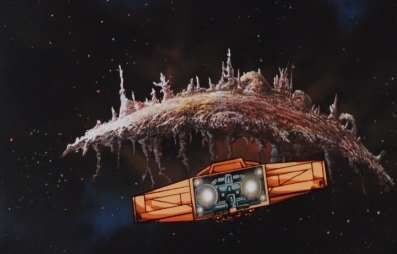 As they begin to look for things they can use to repair their ship, in turns out the planet does have inhabitants on it -and they don't seem pleased by the arrival of their new visitors. 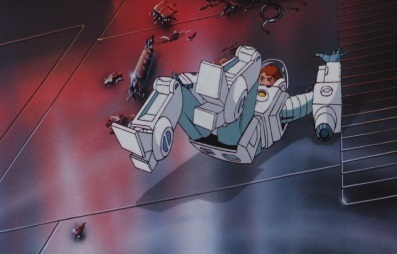 Meanwhile, Hot Rod finishes repairing Kup. 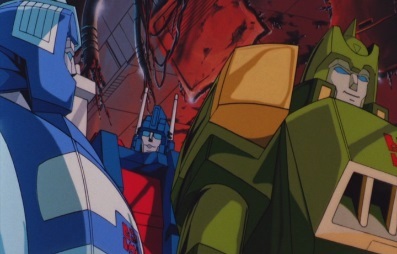 Kup thinks he may have left a piece out, but all in all, he did an amazing job. 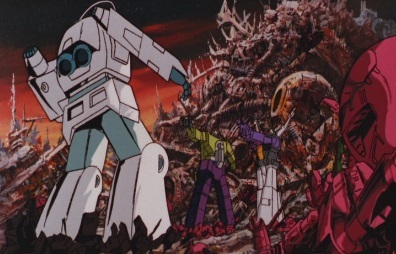 But now they need to find the Dinobots and get off this twisted planet, so the two transform and start searching. 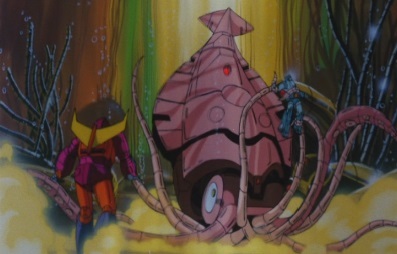 They come across a lake, but as they transform, several robots appear out of it. 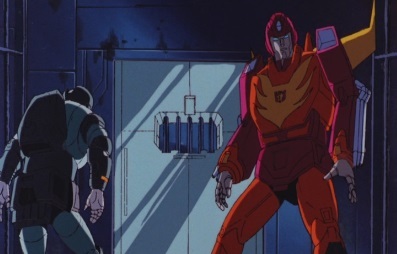 Hot Rod is about to shoot when Kup tells him not to act so hostile. He'll use the "universal greeting". "Bah-weep-Graaaaagnah wheep ni ni bong!" 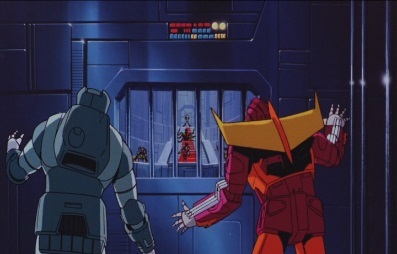 Hot Rod thinks the universal greeting is silly, yet it does seem to work as the robots don't attack them. 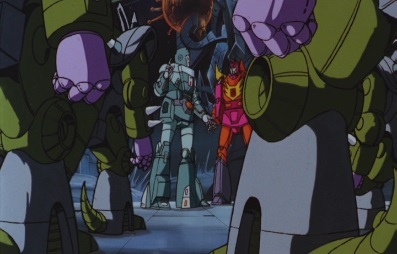 Kup says all they need to do now is offer their new friends energon goodies, which they do. 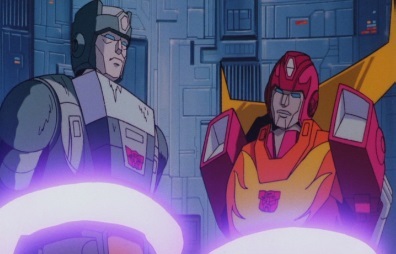 But the robots quickly take all the goodies, and soon Hot Rod and Kup don't have any left to give away. 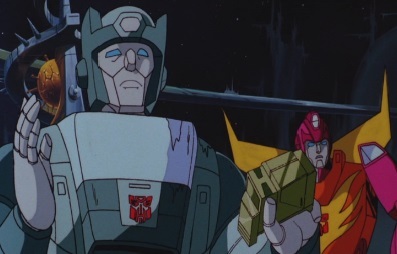 Kup explains that they've run out. 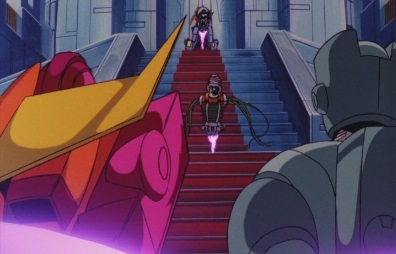 At which point, the robots, known as Allicons, transform and attack. 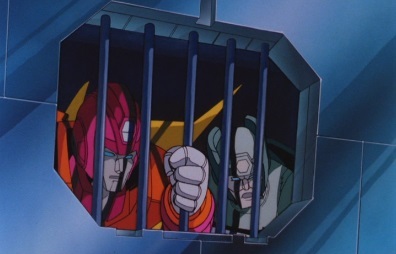 They soon overpower Hot Rod and Kup, who are taken prisoner and led into a prison. 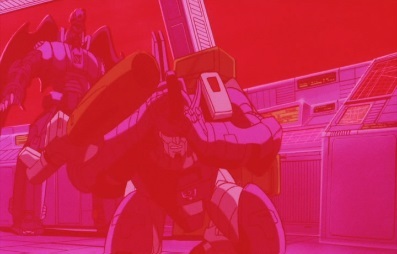 Another Autobot appears, but doesn't go and help them yet. 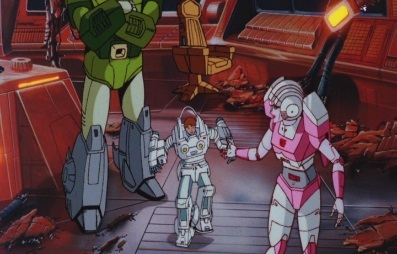 Hot Rod and Kup are taken through to a large room, where they see a robot being sentenced by a race of beings known as the Quintessons. A prosecutor asks the judge if he has reached a verdict: guilty or innocent? The judge says the defendant, who happens to be Arblus, is innocent. 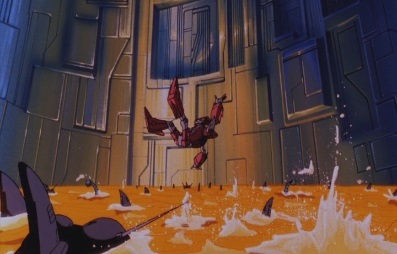 But this still means he is doing to die, as he is dropped into a pool of Sharkticons. The multi-faced judge just laughs. 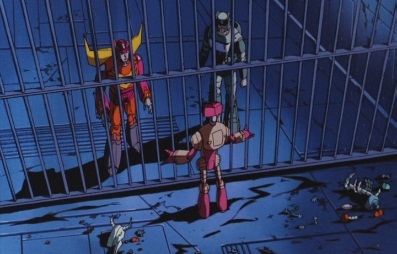 Hot Rod and Kup are put into a cell, where they meet Kranix. 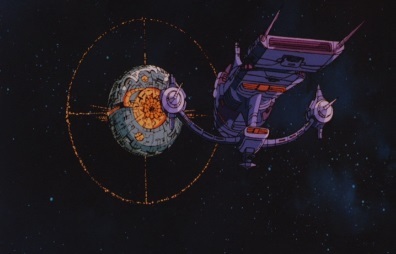 Kranix says that this place is a world of savage Sharkticons and their savage masters, the Quintessons. 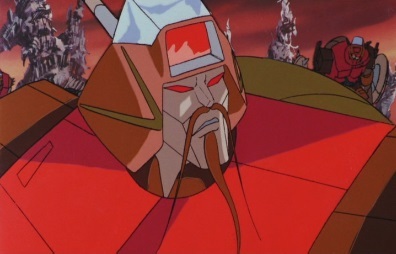 He introduces himself and says his world was destroyed by Unicron. 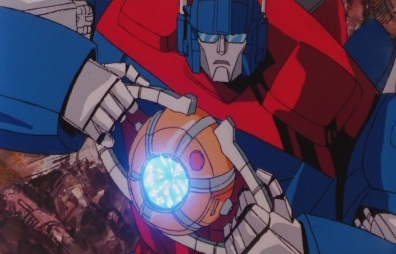 Hot Rod wants to know who Unicron is, and Kranix explains that Unicron is a planet which devours everything in it's path. 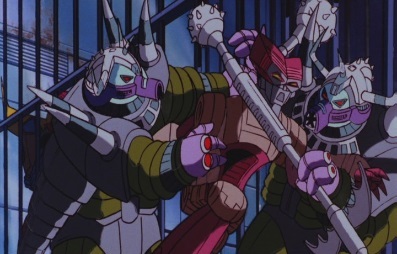 Some bailiffs then enter Kranix's cell, and take him away. 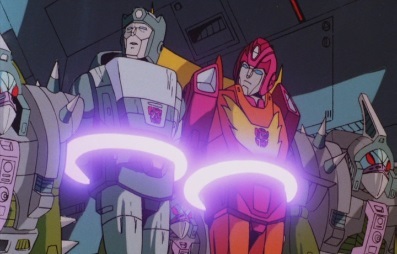 A prosecutor tells Hot Rod and Kup that the two of them shall soon also be sentenced. Meanwhile, Kranix's trial begins, but the judge has already reached a verdict: innocent. 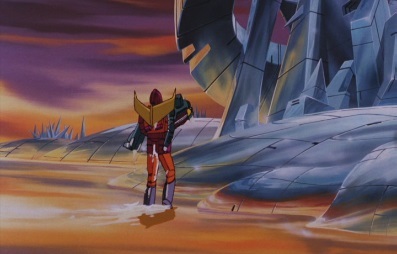 Kranix is dropped into the pool, and the Sharkticons tear him apart. 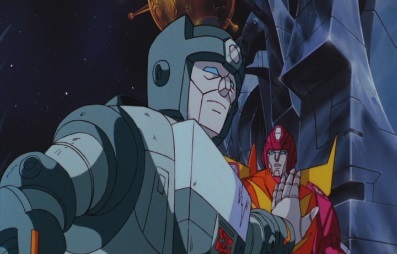 Kup tells Hot Rod that is not an end he'd wish for. 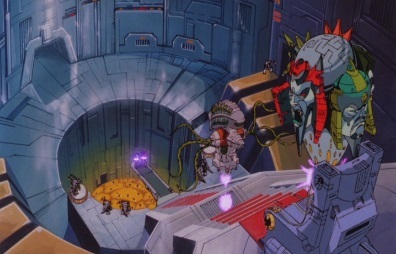 Meanwhile the Dinobots are searching for Hot Rod and Kup. 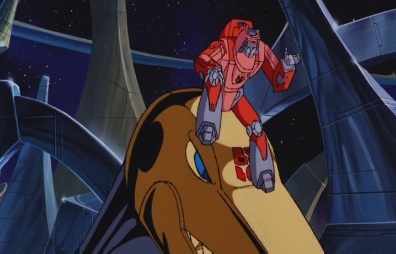 Swoop had been scouting ahead, but as he transforms, he tells Grimlock he didn't see either of them ahead. 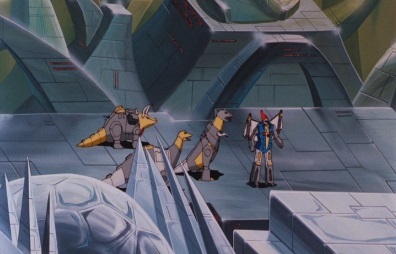 Grimlock is still positive the two are close, but Slag thinks he is full of baloney. 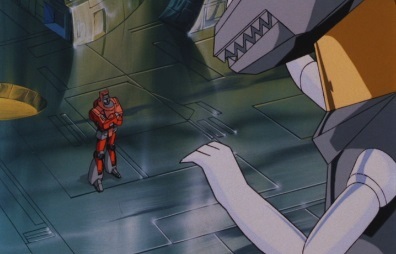 He and Grimlock prepare to fight each other. 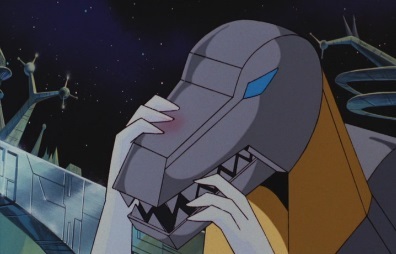 ...hitting Grimlock on the nose. 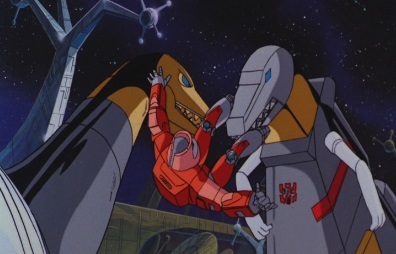 Grimlock wants to know why this boy hit him there, but Wheelie says he can help them find their friends today. 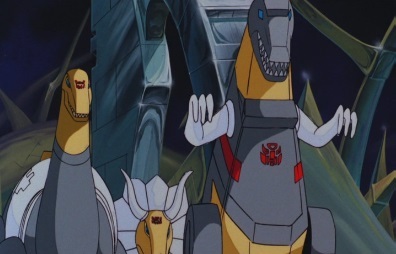 Grimlock says they're on their way. 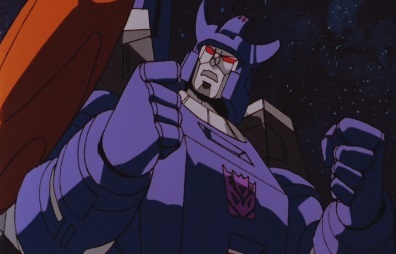 Elsewhere, Galvatron has returned to Unicron, demanding to know why his master tortured him even though he destroyed the Matrix. 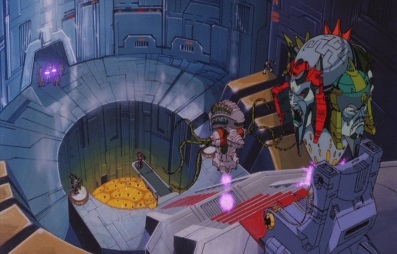 Unicron says he has failed, as the Matrix hasn't been destroyed and Ultra Magnus still lives, as he is now on the Planet of Junk. 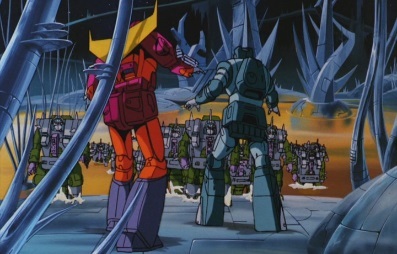 Unicron orders Galvatron to tear Ultra Magnus apart and destroy the Matrix. 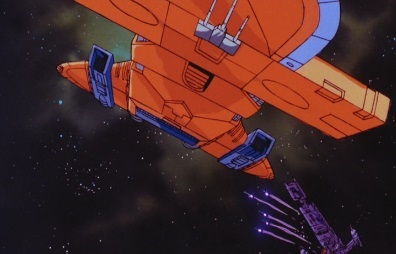 Galvatron gets back on his ship, and the Decepticons head towards the Planet of Junk. 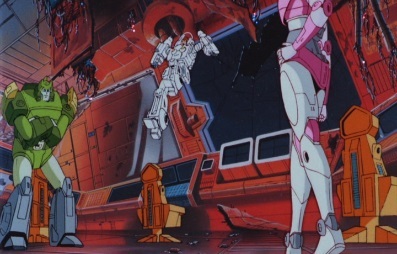 On the Planet of Junk, the repairs to the Autobot shuttle are going well, but the group still don't know about the inhabitants of the planet: the Junkions. 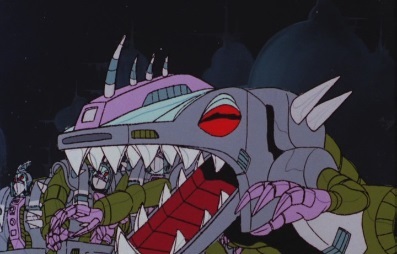 The leader of the Junkions, Wreck-Gar, has gotten a small army together and are ready to attack, but he then decides to wait when he sees more visitors heading their way. 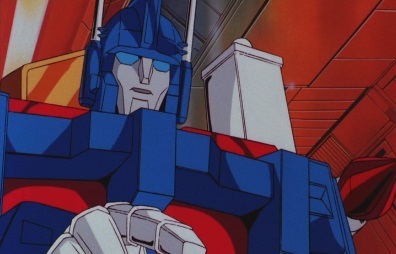 Ultra Magnus sees that the Decepticons have appeared, and tells the Autobots to draw them away from the shuttle. 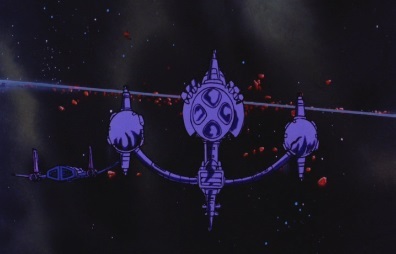 But as they run off, Galvatron pilots Cyclonus, and fires rockets at the shuttle to completely destroy it. 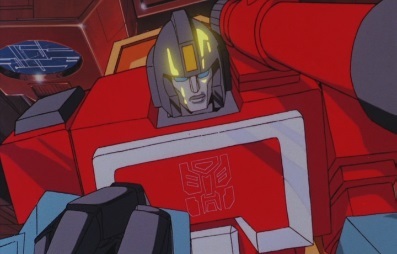 All the Autobots can do now is run. 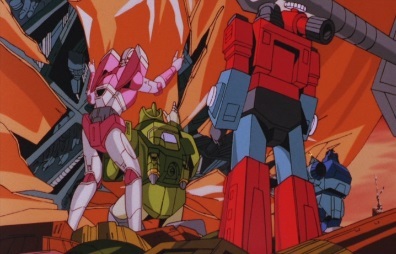 A few Decepticons chase after Blurr, Arcee and Daniel, but Daniel is left to fend for himself when the other two Autobots transform to get away. 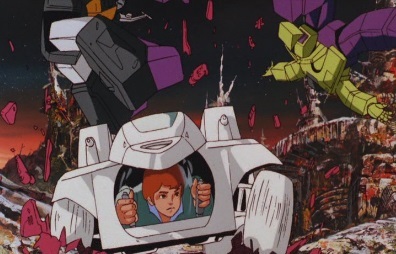 Daniel is then cornered by Scavenger and Shrapnel, but he manages to finally transform his exo-suit to vehicle mode and smash both of the Decepticons out of the way. 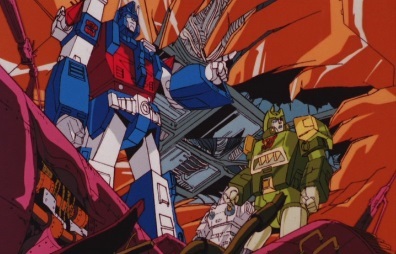 The Autobots regroup, as Ultra Magnus says he'll try to unleash the power of the Matrix on the Decepticons. 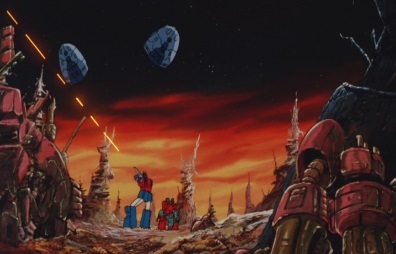 The other Autobots hide, and Ultra Magnus shoots at the structure above them so it falls apart and proves some cover. He then brings out the Matrix, and tries to open it up. 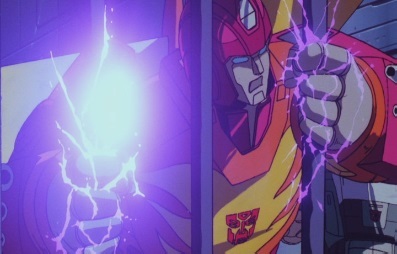 But it will not open, even though Ultra Magnus remembers Optimus Prime telling him it would light their darkest hour... As Ultra Magnus keeps trying to use the Matrix, Galvatron and Cyclonus close in. 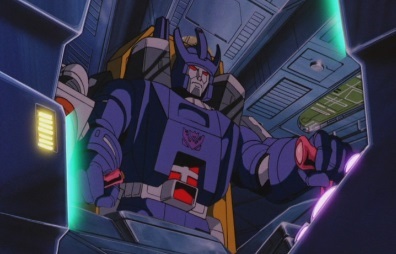 Galvatron wants the Matrix, and when Ultra Magnus refuses to pass it over, Galvatron orders the Sweeps to terminate him. 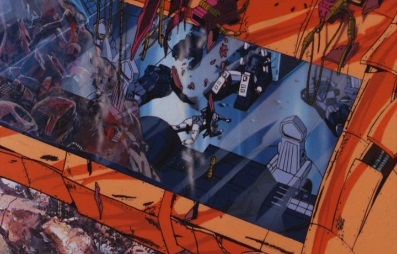 The Sweeps open fire on Ultra Magnus, who is shot repeatedly. 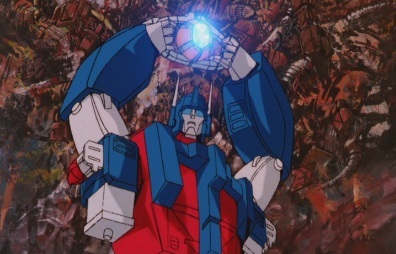 Ultra Magnus drops the Matrix, before falling over and exploding. 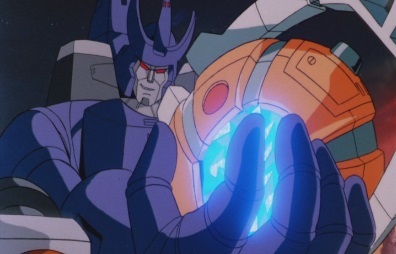 Galvatron catches the Matrix, and says that with this he will make Unicron his slave. 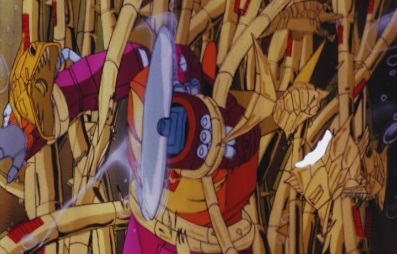 Unicron learns of what his minion plans to do, and screams in rage. 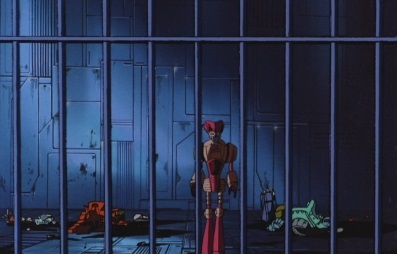 Meanwhile, Hot Rod and Kup are sentenced by the Quintesson judge. They are found to be innocent, but are still dumped into the pool. 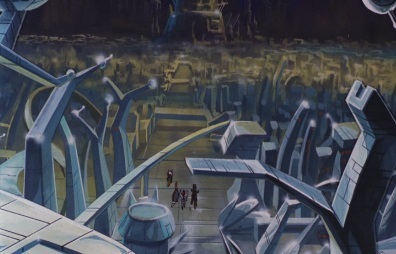 As they fall, their restraints disappear, allowing them to transform. They sink to the bottom of the pool, and start driving around the walls as fast as they can. 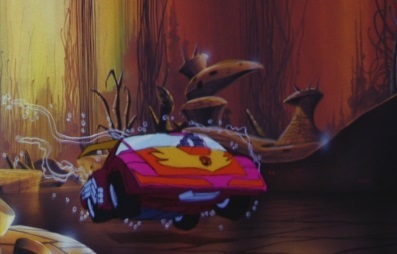 The two pick up enough speed to create a large whirlpool, which the Sharkticons get sucked around in. 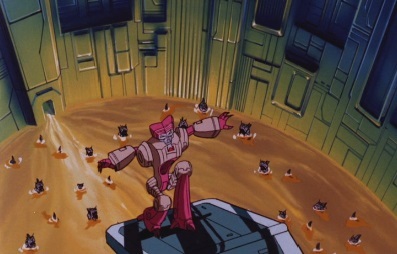 Hot Rod and Kup leave the pool, but the Sharkticons eventually follow them and start to attack. 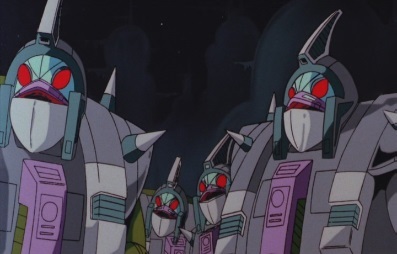 There are far too many Sharkticons for the two Autobots to deal with, and the prosecutor orders for them to be executed. 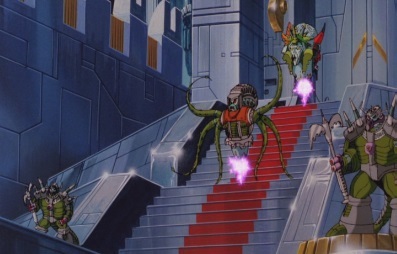 But then a door falls down on him, as the Dinobots appear. 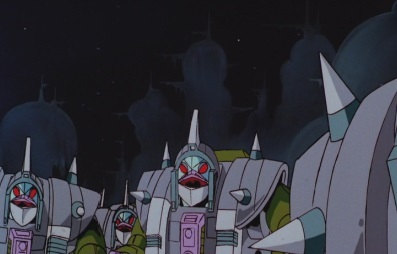 The Sharkticons turn their attention to the Dinobots, but are no match for them and back off. 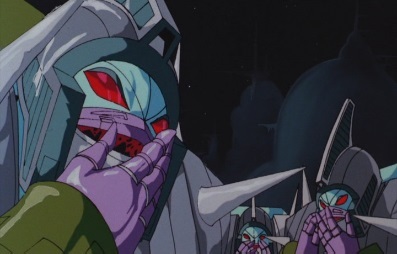 The Quintesson judge tells the Sharkticons to execute the Autobots, but they become confused on what to do and instead transform to their robot modes. 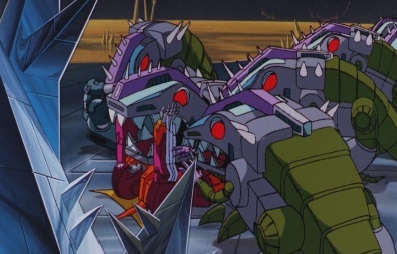 Grimlock suggests that the Sharkticons execute their own masters, something they decide to go along with. 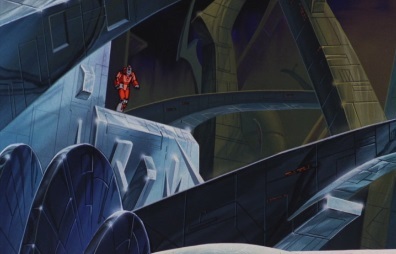 As the Autobots watch hundreds of Sharkticons go after their superiors, Kup thinks the problems on this planet will be fixed very soon. 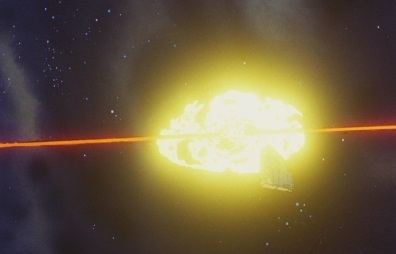 Hot Rod says they've still got problems, as they need a ship. 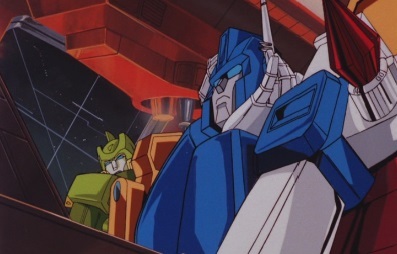 Wheelie tells him he can get them a ship, as long as he can go on the trip. 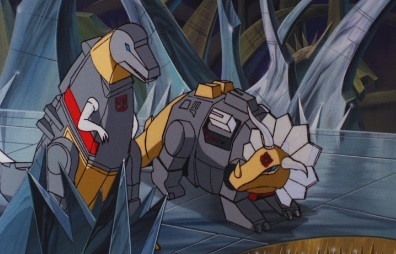 Grimlock explains that Wheelie is a new friend. 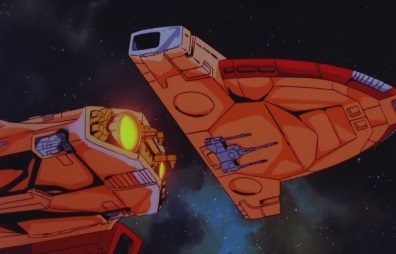 Wheelie points to a ship they can use, which isn't that far away from them. 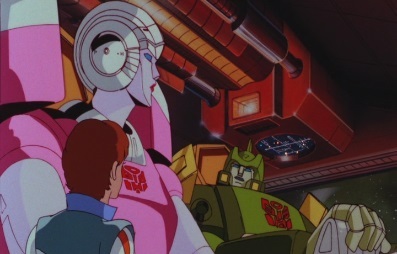 Kup can't quite believe that's a ship, but Hot Rod doesn't care -so long as it can fly. 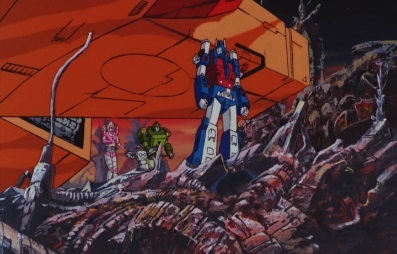 Back on the Planet of Junk, the Autobots have left their cover, and see what has happened to Ultra Magnus. They do not know what to do next, but then they find themselves under attack yet again. 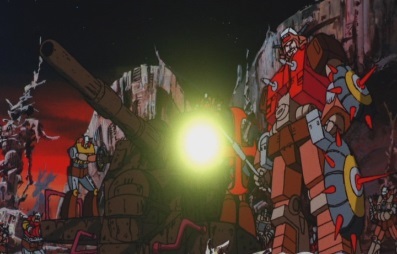 The Junkions have appeared and go after the Autobots. 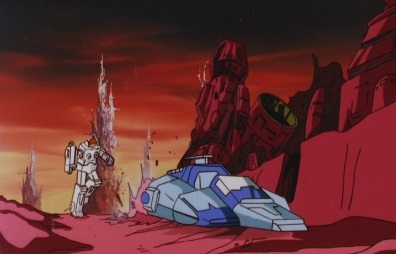 Wreck-Gar says they can check in, but they can't check out. 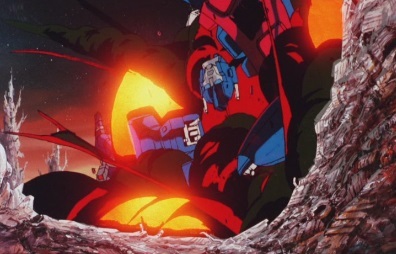 He then gets into a fight with Springer, and looks like he is going to win when he destroys his opponent's sword, but Daniel then smashes him on the back of the heard with a girder. 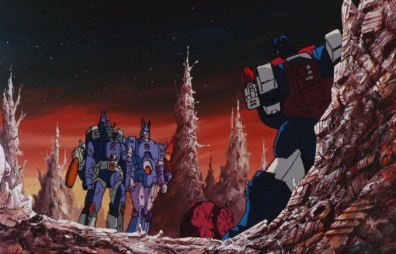 A shadow then looms over all of the Autobots and Junkions. 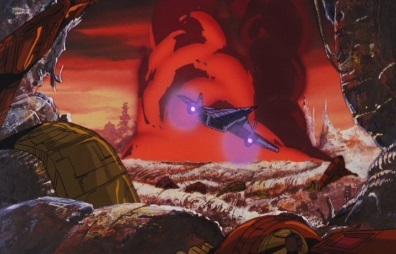 The Quintesson ship has arrived on the planet, as Hot Rod, Kup, Wheelie and the Dinobots step outside. 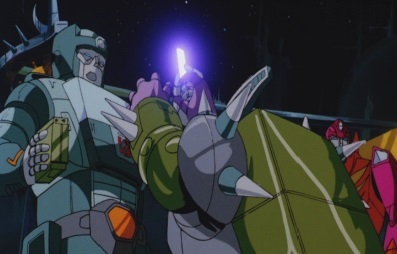 Kup sees the Junkions and pulls out his gun, but Hot Rod tells him that isn't exactly being friendly. He instead tries the universal greeting. 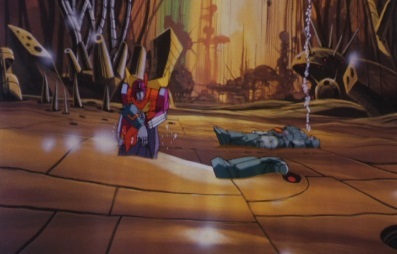 Wreck-Gar instantly understands him, and he and the other Junkions realise that the Autobots are friends, not enemies. 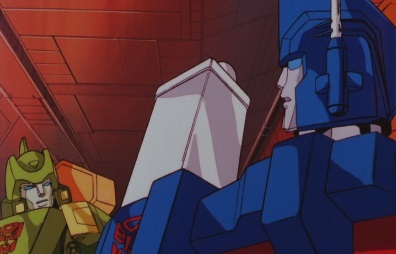 They all start to get along, as Hot Rod asks why Wreck-Gar talks the way he does. He learns that the Junkions all watch a lot of TV, and most of their speech comes from television programs and commercials. 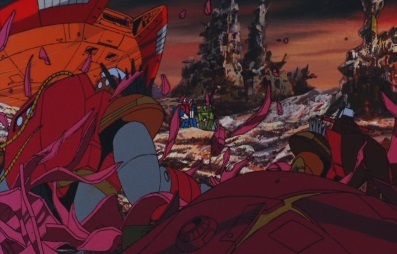 But Wreck-Gar has a surprise for the Autobots: they'll get their smashed up friend as good as new!